Home News Hoboken News Pot in every pot? The Hoboken City Council will weigh an ordinance in December to determine where marijuana establishments should be permitted in town, after hearing from the public on Nov. 19. Hoboken residents are invited to a public meeting on Monday, Nov. 19 at 6:30 p.m. at the Jubilee Center (601 Jackson St.) to discuss how the city might handle marijuana, should it become legal for recreational use in the Garden State. Other municipalities around the state have passed zoning changes so that they have some control over whether stores will be able to sell the substance. The drug has been legal for medical use in this state since 2010, but not for recreational use. It has been legalized for recreational use in nine states and Washington, D.C. 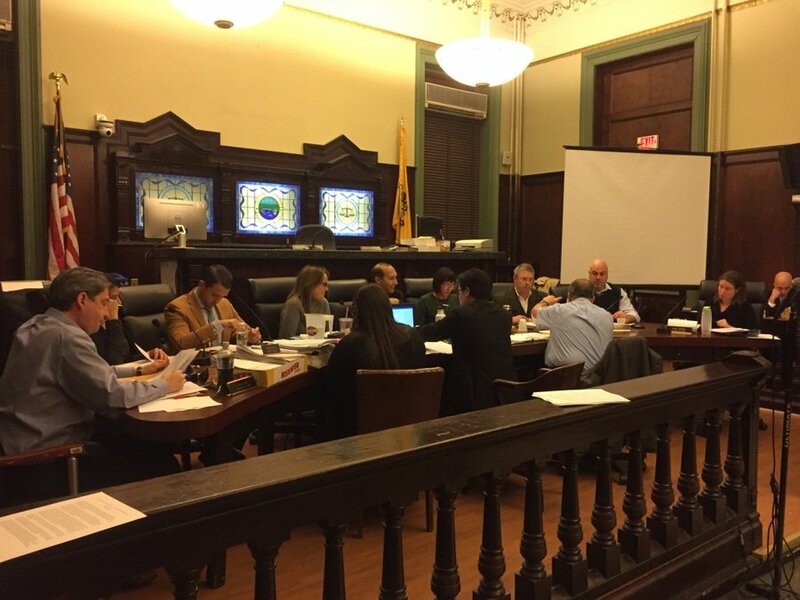 The Hoboken City Council has been considering whether to amend the city’s zoning and licensing codes, and will take comments from the public on Nov. 19 into consideration. An ordinance related to the matter was set to be introduced at the Oct. 17 council meeting but was pulled from the agenda. It designates six areas that would allow the establishments, under certain guidelines. It shies away from residential areas. The ordinance will most likely appear on the agenda in December, after the city and the council have the chance to consider public input. Once introduced by a council vote, it will need to be reviewed by the Hoboken Planning Board for recommendation before it can be brought back to the council on a second and final vote. As currently written, the proposed ordinance would allow the sale of marijuana in six areas of town: the three Central Business Districts and the three areas of town still zoned as industrial. The Central Business Districts include southern Washington Street until about Fourth Street, portions of Newark Street, First Street, Court Street, and Observer Highway, and the area near the Hoboken Terminal. The Industrial zones are the northwest portion of town from Fourteenth Street north and Willow Avenue west, the northeast portion of town encompassing the old Union Dry Dock area, Maxwell Place, the Shipyard, the Hudson Tea Building from Fourteenth street and Willow Avenue north and east to the water, and areas surrounding Observer Highway from Bloomfield to the west side of town. This means marijuana establishments would not be permitted in the city’s zoned residential areas, except on variance approved by the Zoning Board of Adjustment. In order to open a marijuana establishment in any of the above zones the business would undergo a public hearing and the site plan would need to be approved by the planning board. The city would also limit the number of marijuana licenses in town only permitting a maximum of three, and only one per approved zone. Additionally, a license would need to be obtained by the business from the state to operate in town. Local fees for licensing are included in the ordinance, and they would vary. A Class I dispensary or retail store license would cost $15,000 per year, while a Class II marijuana manufacturing license would be $10,000 per year. A Class III marijuana cultivation license would cost $.25 per square foot, a Class IV testing license would be $5,000 a year, and annual license for a Class V marijuana off-site storage facility would be $2,500. The ordinance also states that marijuana establishments will be required to have carbon filtered ventilation systems to mitigate odor and must have 24-hour security monitoring 365 days per year. According to Council President Ruben Ramos, the ordinance will most likely undergo several changes before it will be introduced at a council meeting. One such change could be the elimination of the northeast industrial zone, as he said the area may not be zoned residential but has since become a residential neighborhood. “It may still be zoned industrial but the reality doesn’t reflect that,” said Ramos. Councilwoman Tiffanie Fisher said she believes the zone should be eliminated because, during the master plan reexamination, the Land Use Element recommends rezoning the area residential. According to Ramos the majority of feedback he has received from residents has been “overwhelmingly in favor,” of permitting marijuana establishments in town. Fisher sent out an email blast to her constituents and received over 100 responses, which were mixed. “It ranged from people gung-ho, ready for it right away, to people who don’t want it at all in Hoboken and everywhere in between, but I would say more people were supportive of the idea of some type of marijuana being sold in Hoboken if it is legalized, especially if the municipality were to benefit from it,” Fisher said. The meeting will take place at 6:30 p.m. at the Jubilee Center, 601 Jackson St.